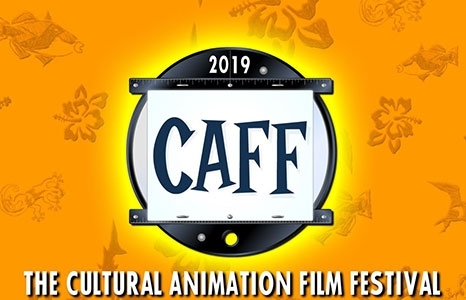 As we get ready for the 2019 Cultural Animation Film Festival (CAFF) in May, see a selection of previously-screened shorts that celebrate cultures from around the world! Created by Gunbalanya Community & Gozer Media. 7 min. The Echidna and the Turtle is a traditional dreamtime story of how the Echidna got her spines and the Turtle got her hard shell. This story belongs to the Kunwinjku people of western Arnhem land. This production was created by students from Gunbalanya Community School. In just a few weeks, students from Namarrkon Class planned and created the animation, designed and built the set and characters, then animated each scene. They were involved in every aspect of the production from narration and sound effects to filming. This initiative is part of a larger project that uses digital technology to influence attendance and literacy within the community school while creating engaging cultural archive materials. Directed by Bernadine Santistevan. 7 min. Wolf Dog Tales is an animated film that takes us through a series of stories inspired by ancient wisdoms of what animals teach us about respecting life and earth. Directed by Thomas Bozovic, Alexandre Cazals, Julien Legay, Chao Ma. 2013. 7 min. Directed by Judy Choi. 2018. 3 min. A comical approach of Korean myth of 'Dangun, the founder of Korea' where a bear and a tiger long to become human. They seek Dangun (here in the animation, the God of the forest) only to find out that it is not an easy task eating mugwort and garlic for 100 days out of the sunlight. Directed by Luciano Blotta. Animation Produced by Twiddle Productions Inc. 2014. 3 min. Brushys' friend poncho has decided to take a brief vacation to San Francisco in order to escape the rough Jamaican street life. Chicken in the Corn is the official animated music video by Jamaican artist Brushy One String. Directed by Rosemary Fung. 2 min. Mr.T's shop accumulates negative 'chi' or energy over the year. Kwan wakes during Chinese New Year celebrations and performs a traditional dance to ward of negative chi and any bad luck and blesses the shop keeper and his shop with good luck and good fortune! Directed by Christopher Caravalho. 2014. 2 min. Mana Comics is a self-published independent comic book company that celebrates ethnic diversity, showcases heroes from Hawaii, and was founded in 2014 by creator Christopher Caravalho. Created by Christina Lau, James Dator Friegon, Jeremy Shea, Julene Viernes, Karen Brizendine, Kyle Domingo, Ray Stanshfield, Sage Tokuda, Sydni Akiyama, Tasuke Suzuki and Tui McBraun. 5 min. Tourist Jim Cameran thought he was going to spend his Hawai‘i vacation taking pictures, but a nearby pueo has another idea. When Jim's camera is unexpectedly taken by the Hawaiian owl, a wild chase ensues. But what begins as the pursuit of a simple camera soon becomes a journey greater than he ever imagined. This animated short was written and wholly created by the New Media Arts Animation student cohort of 2013 for the course ART 294: Practicum. It was a year-long collaboration by the entire cohort to write the story, design, model, and rig the characters and environment, paint the background art, and composite the shots to create this short. Through Keiki Coding, students are introduced to the principles of video game creation, game logic, proficiency and computer skills. Each progressive module is filled with original content and artwork that is created to specifically fit the needs of local students in Hawai’i. Twiddle Productions special place-based curriculum and talk story sessions with artists, animators and game designers, help to guide Keiki in learning how to bring their amazing ideas to life and spark their imagination by becoming a coder! Created, produced and directed by Nathan & Luke Jurevicius. Stunning animation and a fantastical setting of airborne islands, natural and mechanical marvels, nature spirits and alchemical power. Peleda's 10-episode story follows two unlikely sibling heroes embark on a quest to restore balance to their once-glorious homeland. However, Queen Giltine's evil influence has the power to divide even the closest relationships, including the sacred bond between brother and sister. Episode 1 and 2 set the epic story in motion with the arrival of the three sisters to the land of Peleda. Directed by Lukas Von Berg. 2013. Italian. 5 min. A tiny fruit fly gets swatted and against all odds, it defies death in its very own way.